Designed as part of a series of extending oval tables in 1962 for Andreas Tuck, table CH337 was added to the collection of Wegner designs produced by Cal Hansen and Søn in 2011. 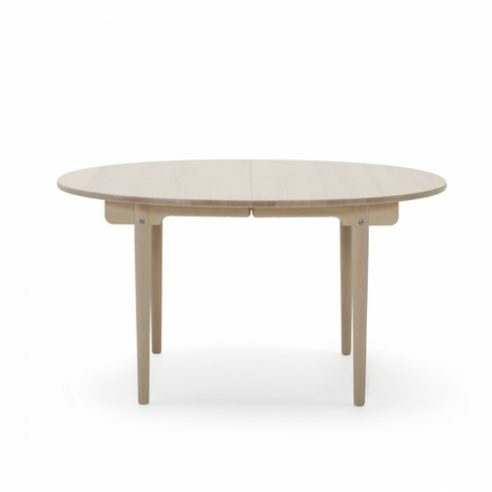 Equipped with extension rails to accommodate up to two 60 cm extension leaves the CH337 oval table is an excellent choice for rooms where space is at a premium. CH337 can extend to seat between six to ten diners. The Wishbone chair produced by the Company since 1950 is one of many perfect choices for use around table CH337. 1949 introduced the young designer to five furniture producers who could produce furniture designed for mass production without compromising the quality of the furniture including table producer Andreas Tuck. Together they formed SALESCO comprising of Carl Hansen & Son who produced chairs, Getama upholstered furniture with timber frames, the upholsterer A. P. Stolen, Ry Møbler makers of storage units and Andreas Tuck the original producer of table CH337.